The Lehman-Tunnell Mansion at 618 Grand Ave. will be among the homes featured on this year’s Holiday Home Tour, which is sponsored by the University Women’s Club. Four homes ranging in architectural style and holiday décor will be viewed during one of Laramie’s popular annual traditions -- the Holiday Home Tour. 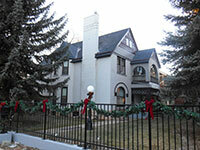 Sponsored by the University of Wyoming Women’s Club, the Holiday Home Tour is from noon-4 p.m. Sunday, Dec. 14. Tickets cost $10 in advance at Ace Hardware and Turtle Rock Coffee. Tickets will be available for $12 at the featured homes on the day of the tour. -- 804 S. Eighth St., Jeffery Van Baalen. One of the few remaining original Victorian houses along Grand Avenue, the Lehman-Tunnell Mansion is listed on the National Register of Historic Places. Built in 1909, the house has gone through a number of remodeling projects and, for the tour, will showcase artwork made by the owner’s mother. The fourth house on the tour is a newly constructed home built in 2010 and designed by the owners. It has a spacious open floor plan and a large family room and theater. The University Women’s Club Holiday Home Tour is the organization’s main fundraising event. All proceeds from the tour go toward annual UW scholarships that assist nontraditional-age women in attaining their higher education goals, Nagy says. For more information about the Holiday Home Tour, visit the University Women’s Club website at http://uwwomensclub.com/.